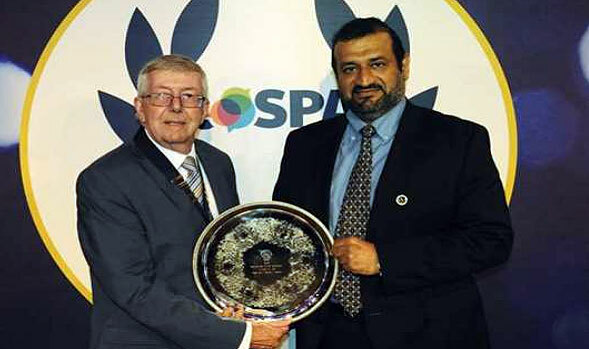 Ras Girtas Power Co wins 2 awards in UK | Qatar Electricity & Water Co.
Qatar Electricity & Water Co.
Pictured: Abdul Majeed al-Reyahi (right) receiving the RoSPA Electricity Industry Sector Award at a ceremony in the UK. Gulf Times – Ras Girtas Power Company (RGPC) has won the first place in two major award categories at the RoSPA (Royal Society for the Prevention of Accidents) Health and Safety Awards, the longest-running industry awards scheme in the UK. RGPC, located in Ras Laffan Industrial City in Qatar, won the RoSPA Electricity Industry Sector Award and International Sector Award, the company said in a press statement yesterday. The RoSPA Health and Safety Awards are now in their 61st year. Mohamed Nasser al-Hajri, chairman of the board of directors of Ras Girtas Power Company, expressed his thanks and appreciation to the company management and organisers and wished them to continue with the run of success in the years to come. “These prestigious awards are a testament to the world-class safety standards we maintain at Ras Girtas, and most importantly, they recognise our commitment to operating safely, efficiently and reliably,” he said. The awards were received by RGPC CEO Abdul Majeed al-Reyahi and COO Ian Lawrence from Lord McKenzie of Luton, RoSPA president. On the occasion, al-Reyahi said winning the two safety awards “was an incredible feat for us in our journey to be the best power plant in the region, and especially being recognised by the world-renowned and prestigious RoSPA award is a huge honour as well as a great recognition of our excellent health and safety performance”. This is the fifth consecutive year that the company has won the RoSPA safety awards, al-Reyahi noted, extending his thanks and appreciation to staff and contractors for their support and commitment. The RGPC plant in Ras Laffan Industrial City in has an installed capacity of 2,730 MW of net power dispatch and 63 MIGD of potable water dispatch. Recently, RGPC completed more than 12mn man-hours and eight years of operations without any lost-time injury for employees and contractors. We are Qatar Electricity & Water Company. The second largest utility company in the MENA region. We are the main supplier of electricity and desalinated water in Qatar with a market share of 62% of electricity and 79 % of the water. Qatar Electricity & Water Company. Copyright © Qatar Electricity & Water Co. All rights reserved.